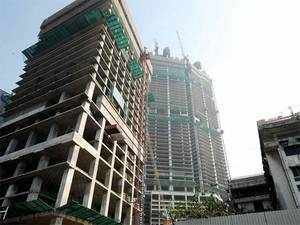 NEW DELHI: Over 4.65 lakh units, worth over USD 47 billion, are facing significant execution delays across major Indian cities due to sales slowdown, cash crunch facing developers and issues related to project approvals, says a PropEquity report. The current value of these units is Rs 3,32,848 crore (over USD 47 billion), said the report by real estate data and analytics firm. “The delays in these projects range from 2-8 years and there is no certainty when these would be completed,” PropEquity Founder and MD Samir Jasuja told PTI. The real estate sector, especially housing segment, is facing a multi-year slowdown that has led to significant delays in execution of projects. Home buyers have been forced to protest on roads and approach courts seeking relief. “Real estate in India may be witnessing green shoots of recovery in select micro markets however over 4.65 lakh units of housing projects across India are significantly behind their delivery deadlines with daunting construction delays…Total value of projects facing construction delays is Rs 3.3 lakh crore or over USD 47 billion,” the report said. It attributed the delays in delivery of projects, to many reasons including financial constraints, execution challenges, surplus supply due to over ambitious launches by developers, environmental clearances and slowing sales among others. “Although the markets are facing significant execution delays we do expect the reputed developers to perform well. We also anticipate that the resolution to this difficult scenario will occur in the form of consolidation that will be led by the larger and more capable developers who have the construction and execution capability to meet their promises,” Jasuja said. According to the report, nearly 1.80 lakh units valued at Rs 1.22 lakh crore are facing an uncertain future in the NCR region (Gurgaon, Noida, Greater Noida, Ghaziabad, Faridabad). Similarly, in the Mumbai Metropolitan Region (MMR), 1.05 lakh units worth Rs 1.12 lakh crore are pending completion. MMR includes Mumbai, Navi Mumbai and Thane. As Bangalore is an end-user driven market, 38,242 units are still to be handed over to buyers. The total value of these units is Rs 26,454 crore. In Pune, 22,517 units worth Rs 14,111 crore are pending while Chennai has 20,847 stuck units worth Rs 9,511 crore. In Kolkata and Hyderabad, only 15,552 units (worth Rs 6,175 crore) and 13,710 units (Rs 7,778 crore), respectively, are pending execution. As per the report, in Tier 2 Cities, as many as 303 projects having 68,094 units, worth Rs 30,120 crore, are yet to be delivered. “Our latest research further reiterates that projects that are completed or nearing completion are attracting maximum buyers as these projects seem to be most risk averse in the eyes of the buyer. However, we also believe that projects by renowned developers, with strong fundamentals would continue to do well irrespective of stage of construction,” Jasuja said. PropEquity said that it covers over 98,370 projects of 26,881 developers across over 42 cities in India with 300 projects being added to the database every month.